An essential area within the home, the bathroom has become more than just a place to carry out hygiene routines; it’s also a space in which to relax. With this in mind, tranquil bathroom designs are in demand now more than ever. From the flooring to the vanity unit, all aspects of a bathroom should be carefully considered. Here, Sydney Home Design + Living provides a guide to selecting complementary materials and finishes to create a perfectly balanced space that’s overflowing with visual appeal. Most commonly used in the manufacture of showerscreens, glass is an effortlessly sleek material that remains popular in many areas of the home. 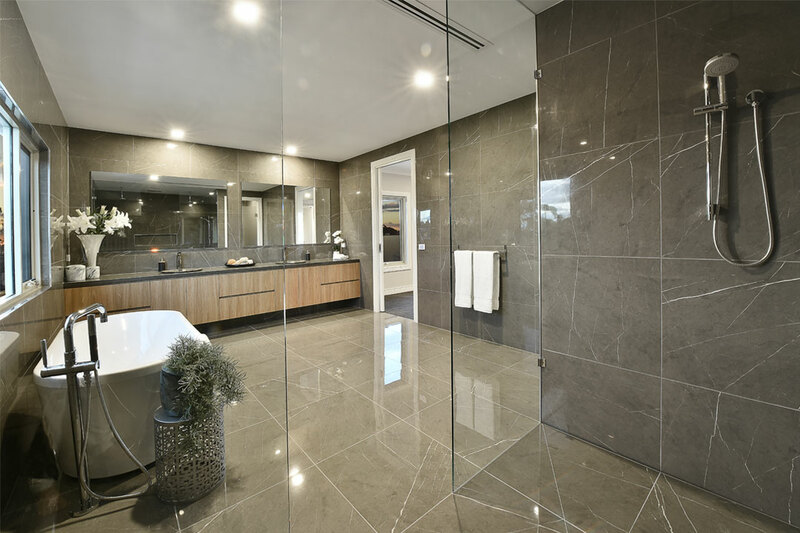 The shift towards spacious and streamlined interiors suggests that transparency is on trend, but what does this style have in store for the bathroom? If you’re after a stylish and unique feature, a glass bathtub will perfectly complement modern bathrooms. Glass tubs can be fully customised and are available in a wide range of shapes and sizes to ensure you soak in style. If you’d prefer to incorporate something that’s more subtle but still has plenty of visual interest, a frameless glass showerscreen or a semi-enclosed glass brick wall are perfect alternatives. Sophisticated glass benchtops are also popular at the moment. While glass shelves and splash guards are minimalist in their design, when combined with other glass elements such as tapware and basins, these small additions can significantly enhance your bathroom’s overall aesthetic. For a well-balanced space that’s unmistakably modern, chrome fixtures will look right at home alongside glass elements. hues and textures to suit your space. Regardless of where or how you use it, glass will almost always add a touch of luxury to your space. Just be mindful that water marks and fingerprints are highly visible on this surface, so it will require regular cleaning. If you’re looking for a low-maintenance bathroom material, glass may not be the best option for you. Further, glass can be easily damaged, so it needs to be fitted by an experienced professional. variety of styles, hues and textures to suit your space. While stone flooring is undeniably timeless, a striking stone bathtub will provide your bathroom with instant ‘wow’ factor. Similarly, a stackstone feature wall in the shower is another simple way to add interest to your space, while an impressive granite countertop is sure to draw the eye. If you think marble is magnificent, opt for a simple black and white colour palette to highlight this precious material and create the ultimate luxe look. Beyond its beauty, stone is a naturally porous material, which can affect its strength and stain resistance, so it’s important to do your research and consider whether it is the right choice for you. For the bathroom, opt for a hard, non-absorbent material like granite or slate, as more permeable stones will require regular sealing and cleaning to prevent stains. Known for its strength, durability and sustainability, concrete is a staple building material. It is becoming more popular in residential interiors for the functional and decorative finish it provides. The adaptable quality of concrete lends itself to endless uses and styles, whether you’re after a warm and tactile feel or an urban contemporary look. Due to its resilient nature, concrete is gaining popularity as a flooring option for almost any room of the home. However, the floor isn’t the only place concrete can look fantastic in your bathroom. 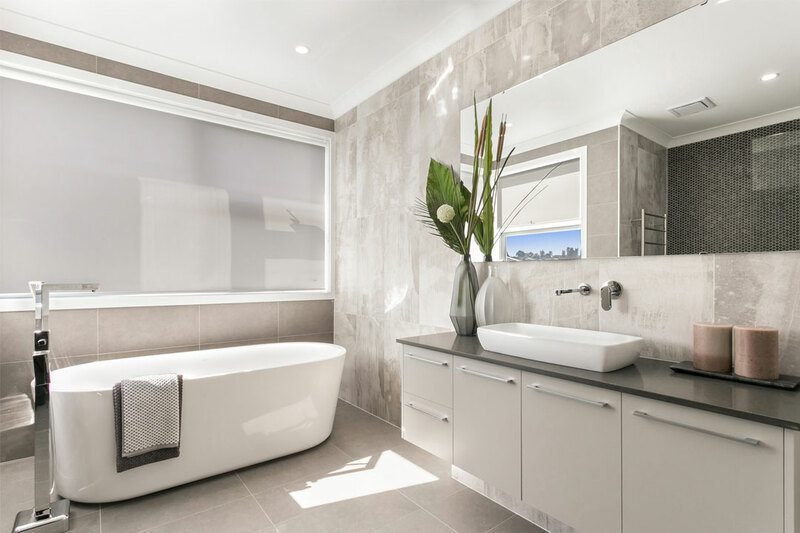 Statement-making concrete benchtops and feature walls are gaining popularity, as are other practical bathroom furnishings such as concrete built-in chairs or benches, which can double as works of art. While concrete is typically used to achieve an industrial or modern aesthetic, it can be styled in a number of ways. If you want to take a pared-back approach, incorporating smaller concrete elements into a room such as vases and bathroom hooks will achieve a sleek and minimalist look. For all its visual appeal, concrete flooring can feel quite cold underfoot. Installing an in-floor heating system beneath the concrete during construction will ensure your toes stay toasty. they’re less likely to be affected by moisture, warping or swelling. When deciding which timber to use, it’s important to consider the tightness of the grain, as well as the overall look and feel of the wood. If you’re pining for timber elements, a wooden sink is a fantastic statement piece, but be sure to speak with a qualified professional about its installation, as special plumbing may be required. Using timber veneer for both your bathroom and kitchen cabinetry doors is another popular trend that will create a harmonious result. Further, decorative wooden wall panelling is a charming alternative to tiles that will not only enhance your bathroom’s style but also add depth. 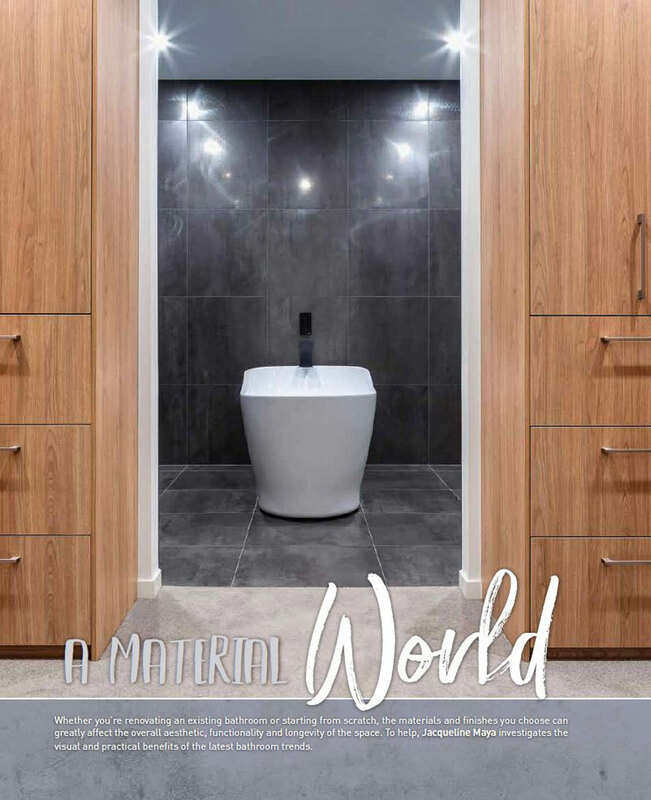 If space is an issue, selecting a lighter-coloured timber will make your bathroom appear more spacious, while rich, dark varieties will look incredible in a larger area. Whatever timber you decide to use and wherever you choose to use it, it needs to be treated with a high-quality sealer to ensure a long-lasting result. Last but not least, your tapware forms an integral part of your bathroom. Not only do these small yet necessary fixtures supply the water, but they can tie your entire bathroom together. Freestanding bathtub spouts and shower heads are popular choices among modern homeowners, and square tap designs are now in demand over their curved counterparts. The resurgence of industrial materials within the home extends to the bathroom as well, particularly where fixtures are concerned. Incorporating brass, bronze or copper tapware is an excellent way to add a touch of colour to an understated palette. For a bathroom that exudes opulence, matte black or polished-gold finishes make excellent options. to select fixtures of different shapes. To ensure that your fixtures match your bathroom’s overall style, select one design that you absolutely love and implement it throughout the entire space. 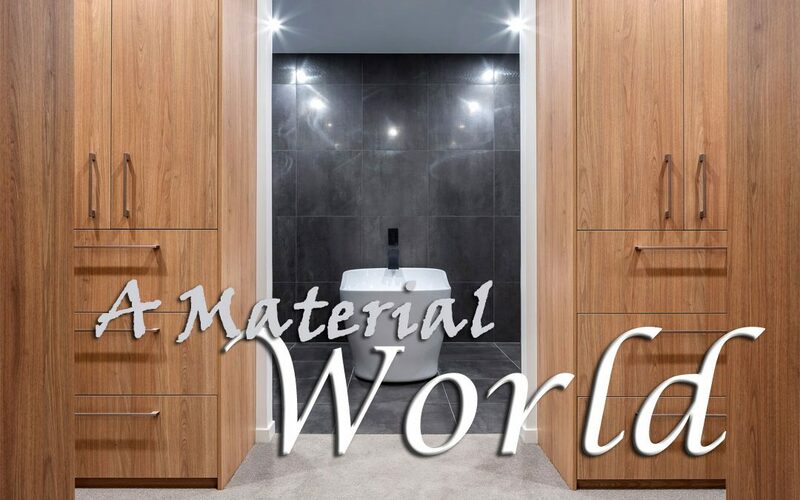 Whether you envision your new bathroom as a divine relaxation space or a highly practical haven, or a bit of both, selecting the right materials and finishes will ensure the space stands the test of time, and will help the stresses of everyday life to simply wash away.